Compresso program has features that optimize the HTML code faster loading site, transfer and reduce the load on the site. Effects of the program are scored by Google, Yahoo and have a huge impact on the occupied site in the search results. 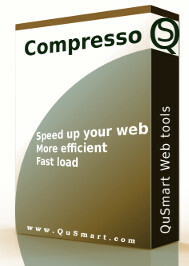 Compresso Freeware Key Features:speed up your web page; faster loading; more efficient; download for free. Qweas is providing links to Compresso Freeware 1.2 as a courtesy, and makes no representations regarding Compresso Freeware or any other applications or any information related thereto. Any questions, complaints or claims regarding this application Compresso Freeware 1.2 must be directed to the appropriate software vendor. You may click the publisher link of Compresso Freeware on the top of this page to get more details about the vendor.